New York City Struggles To Keep Up With High Homeless Numbers The number of people sleeping in New York's shelters has been slow to fall after hitting a record high of 59,000 last year. Advocates for the homeless say more New Yorkers are living on the streets. 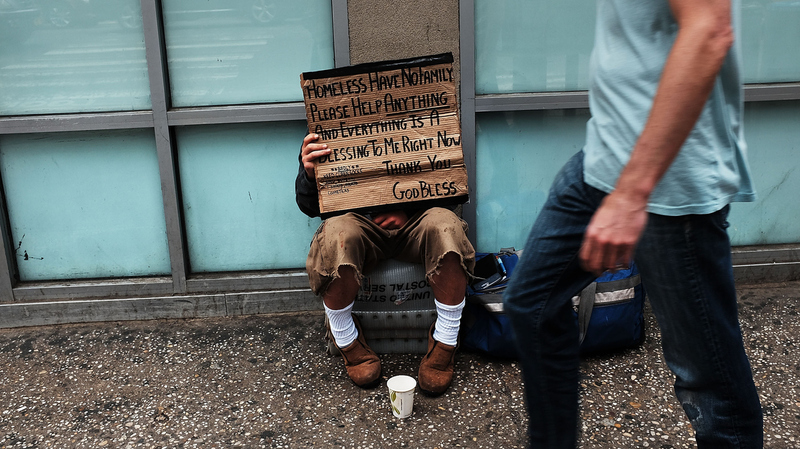 A homeless man panhandles along Manhattan's Eighth Avenue in New York City. "Good morning! Two pieces?" asks Mario Cornejo, as he places slices of frosted banana bread on paper towels for a long line of hungry people. "It used to be just a small pot before," explains Cornejo, a volunteer with a New York group called Food for Life since 2008. "Now it's a big pot and bigger salad containers, more trays of cake." With warmer weather, he says he's seen more homeless people lounging in the park and lining up for free meals. More On Homelessness Around The U.S.
"Some do live in shelters. Some live in the streets," he says. "We're going through difficult times." Homelessness in New York reached an all-time high last December, when about 59,000 people were sleeping in shelters, according to the city's records. That number has dipped slightly in recent months, now at around 56,000. Mary Brosnahan, who leads the Coalition for the Homeless, an advocacy group, says there are likely more homeless people living on the streets than the city's official count of about 3,000 from a street survey conducted in February. "The numbers just keep going up and up and up," she says. "There are just many more homeless, single adults than we've ever seen before." Many advocates like Brosnahan say homelessness is so high today in New York because of policies under former Mayor Michael Bloomberg, who cut a rent-subsidy program for homeless families after state funding dried up in 2011. Judith Goldiner of The Legal Aid Society in New York City adds that the city's real estate market squeezes out many low-income families, making homelessness especially hard to solve. "It's not enough anymore in New York City to give people some money to help them pay for the rent," she says. "You really have to help people find an apartment, because finding an apartment in New York City — even for people who are not homeless — is just an incredibly difficult process." New York's current mayor, Bill de Blasio, has beefed up funding to help more families find permanent housing and pay for rent, as well as to improve shelter conditions and open new facilities. He recently announced a $22 million mental health program that includes more treatment for mentally ill people living on the streets. 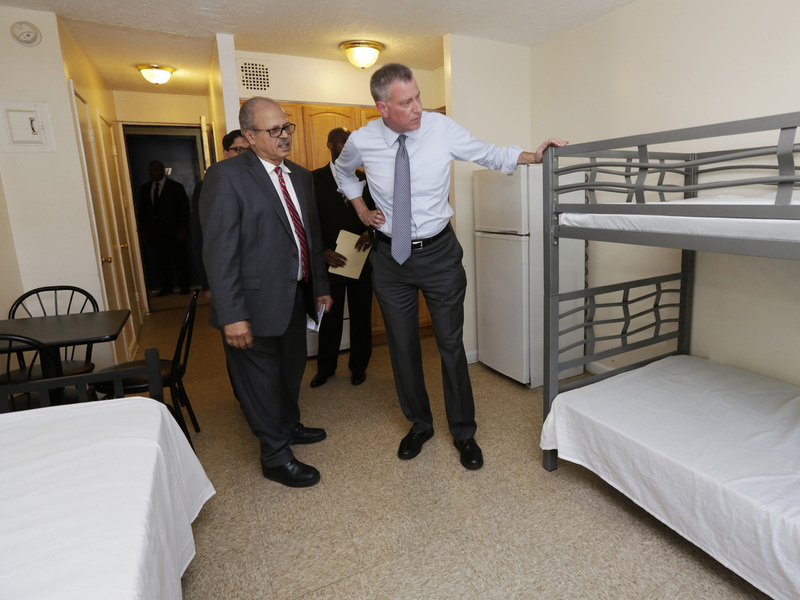 New York Mayor Bill de Blasio (right) visits a room at the Corona Family Residence, a homeless facility in the Queens borough of New York, in May. "The goal is to improve outcomes for all the clients that we serve, and that's what we're pushing forward to do. I believe that our work will speak for itself," says Gilbert Taylor, New York's commissioner of homeless services. Still, the city's 311 hotline has been receiving more complaints about homeless people since de Blasio took office in 2014. This summer, de Blasio has come under fire from New York Post editorials warning that "a surging vagrant population" in Tompkins Square Park could make the city "menacing and unlivable." Christina Greer, a political science professor at Fordham University, says it's a problem of perception. "When people think about homeless, especially homeless men, in the street, they think about someone who is outside when it's dark and susceptible to committing crimes," Greer says. "This is coded language that I think is being used to signal that this particular administration is not keeping the city safe." The city's overall crime rate is down 5.6 percent compared to last year, according to the latest numbers from the New York Police Department. But almost half of voters in a recent poll by Quinnipiac University said that crime is a "very serious" problem and that quality of life has gotten worse in the city. "If New Yorkers feel that the city is less safe, if they feel that homelessness and petty crimes and violent crimes all go hand in hand, then we're looking at a one-term mayor," Greer warns. De Blasio still has a couple years as mayor to clamp down on homeless numbers before he's up for re-election. But back in Tompkins Square Park, 35-year-old Ronald Davis is under a shorter timeline. He says he's been homeless in New York for about three years and has spent nights near the park, carrying around his clothes in a ripped blue backpack. But Davis doesn't want to do it anymore. He says he recently checked into a transitional housing program. "I can't sleep in the streets," he says. "That's tearing me up — the bugs, the filth, the sweat, cops messing with you. It's just too much."